Peptides promise to be useful drugs, but they’re hard to handle. 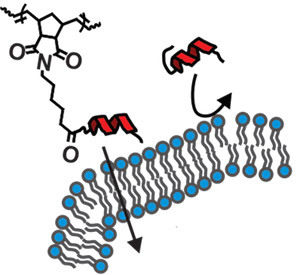 On their own peptides (shown as red helices) can’t easily penetrate the membrane of a cell. Adding a small, brushlike group of atoms helps them through. Because peptides, like proteins, are chains of amino acids, our bodies will digest them and excrete the remnants. Even if delivered to their targets intact through intravenous injection, peptides mostly can’t get into cells without help. “We have this platform that could revolutionize peptide therapeutics,” said graduate student Jacquelin Kammeyer, who helped to develop the new method. “People discover interesting drug candidates that prove difficult to use. If the medicine can’t be swallowed in a pill, it ends up being used only for last-resort, ‘salvage’ treatments,” said postdoctoral fellow Angela Blum. Blum and Kammeyer contributed equally to the study. Nathan Gianneschi, assistant professor of chemistry and biochemistry, guided the effort. Peptides can be protected from digestion by arranging them as a densely packaged brush, Gianneschi’s group has shown in earlier work. Now they report in the journal Chemical Science that the brushes can help peptides enter cells without changing their biological function. The exact means of entry into the cells aren’t fully understood, but the researchers believe the charged brush helps the membrane engulf the peptide. The group worked out their system on a “nonsense” peptide that has no known function in cells, but could be manipulated to attach varied appendages at different positions along the amino acid chain. Funding for the work was provided by the National Institutes of Health through a Director’s New Innovator Award, a Common Fund Transformative Research Award, and a research grant through the National Institute of Biomedical Imaging and Bioengineering; the Air Force Office of Scientific Research Presidential through an Early Career Award for Scientists and Engineers and a Basic Research Initiative grant. Blum is supported by the American Cancer Society’s North Texans Creating Tomorrow’s Miracles Postdoctoral Fellowship. This research made use of the UC San Diego School of Medicine Microscopy Core which is supported by a core grant from the National Institute of Neurological Disorders and Stroke.